With solemn dirge and funeral song. 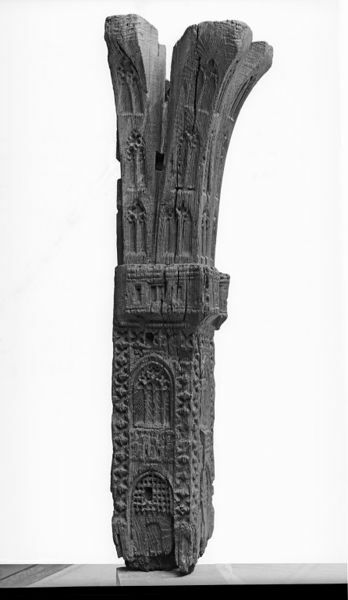 Corner or Jetty-Post, known as 'Finney's Post'; the lower part has on each of the two faces a pair of arched panels, the lower two containing a portcullis, the upper two a four-light window; in the middle of the post is a raised band surmounted by battlementing and having two projecting turrets at the corners; the upper part is formed of three curved spurs, the face of each carved with 3 traceried two-light windows. Carved on the outer faces of the two outer spurs (at top) with stylised leaf ornament. One of the two plain (built-in) faces with two large mortices (at top and bottom), and two smaller (and evidence of others), and within a long rebate two further mortices, and one original peg. Looking from above the post, an L shaped tenon is visible, sitting within a well formed by the three spurs. 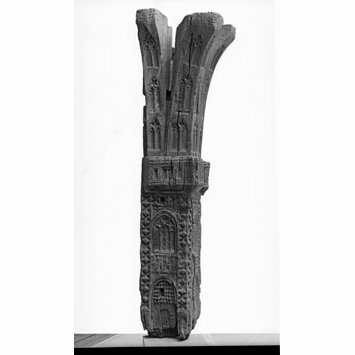 At the top, between the spurs are two plain recesses, each with a large, vertical mortice, possibly originally holding applied ornament. In 1920 Mr Bertram Sergeaunt (apparently the husband of one of Mr Thornewill's daughters, Mr Thornewill's father having purchased the post from Lord Anglesey), invited the Museum to purchase the post after it did not meet its reserve (£200) at auction. The Museum purchased it for £50 from Bertram Sergeaunt. A letter from H.B.Marsh (Librarian and Curator of the Public Library, Burton-Upon-Trent), 10/11/1922, was sent to the V&A, noting their unsuccessful attempt to purchase the post at auction, and requesting a photograph of the post, and loan (for six to twelve months, of 'any indefinite period suitable to' the Museum). That gave my dear so hard a Bump." Probably the first half of the 15th century.